I found this gem on Reddit. Actually, I didn't find it on Reddit but through a Google image search that took me to Reddit. 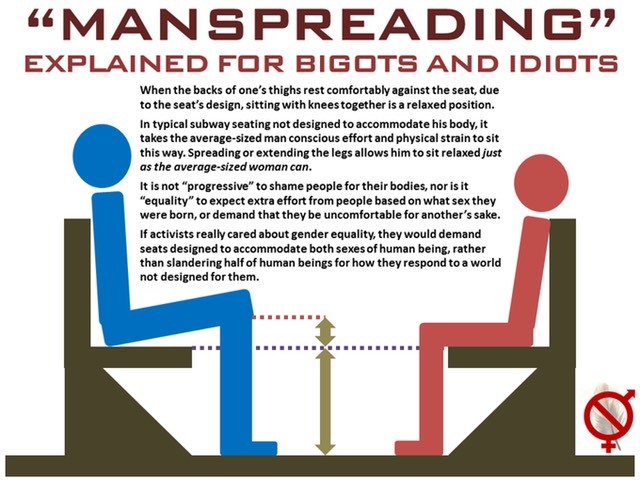 And yes, I was searching for images of manspreading. What can I say? It is a bit of an obsession. Hell, I even set up a Google alert so that I'd be notified when there was breaking news on the subject. And you know what? There's always breaking news on manspreading. From the week I wrote this post (which was over a month ago), there were reports that men sitting comfortably on public transportation is evidence of "sexist environment," something we are supposed to fight against, global news, and that there is a brand new thing called "beach-spreading." The real news, of course, is that people continue to use their social media accounts to complain about how some men sit. I regularly check in on the #manspreading hashtag on Twitter and am rarely disappointed. Near constant outrage and public shaming abound. And sadly, this is what some people are now beginning to associate with feminism.